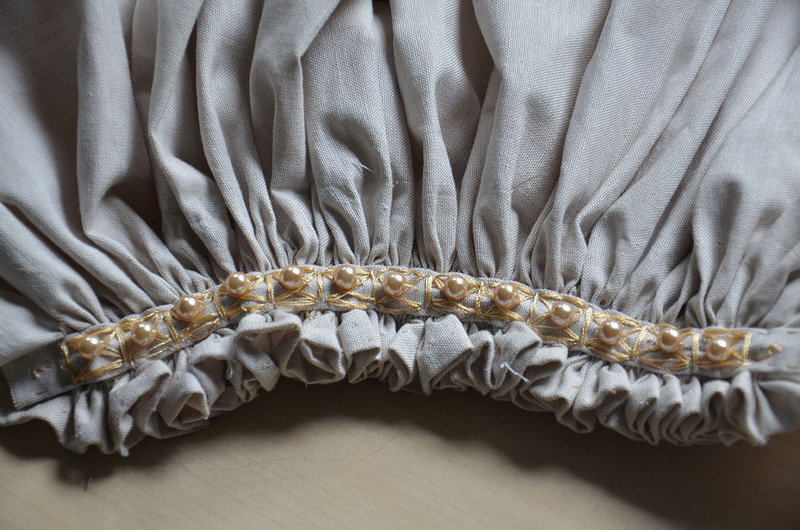 Here is part two of making my beaded chemise, part one talks about the actual beading process and can be read here! 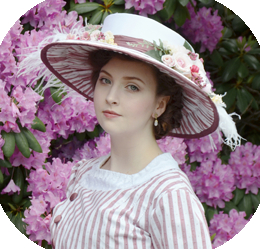 In addition to photos and a lot of rambling, I also have another video to share! I’m not too happy with how this turned out, it’s a bit choppy due to big variations in lighting, angle, and zoom. I’ll try to get that sorted out for future videos, but for now it’ll have to do! 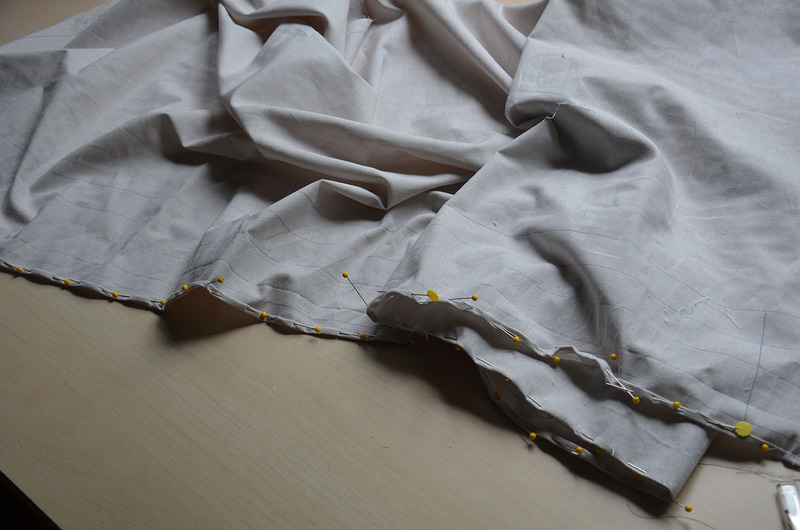 This video shows pretty much every step of this project, from beading the collar to hemming the skirt and everything in betwee. If you are seeing this post in an email you can access the video here, otherwise you can view it below! 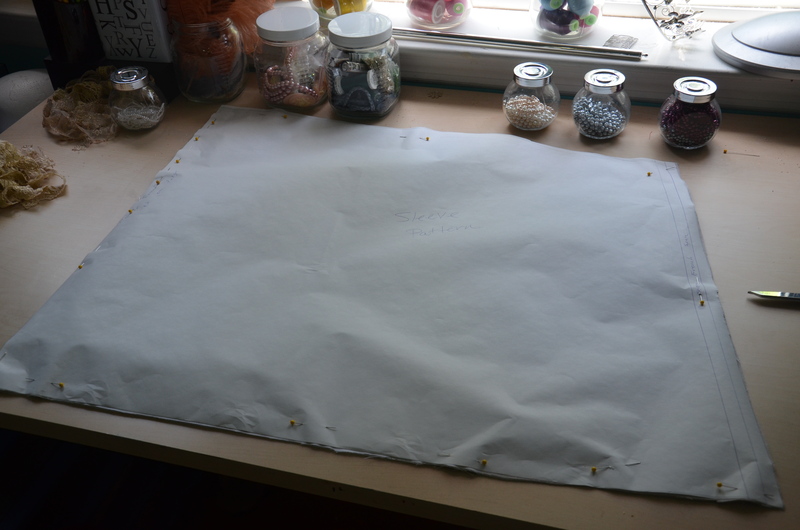 Step one was drafting the sleeve pattern – it was absolutely massive! Once it was cut out it was even more ridiculous. 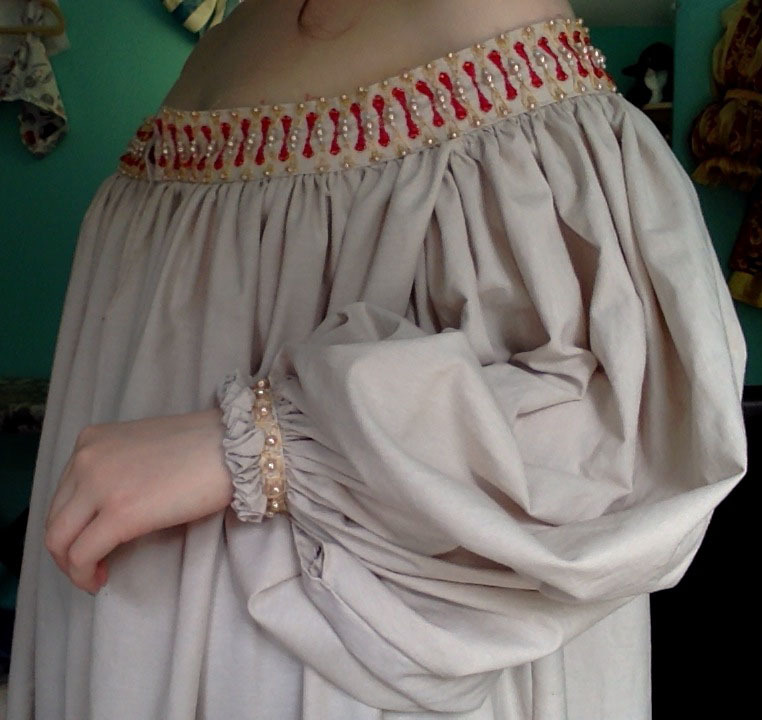 I pinned my sleeves to have a quarter inch rolled hem, not an easy task! 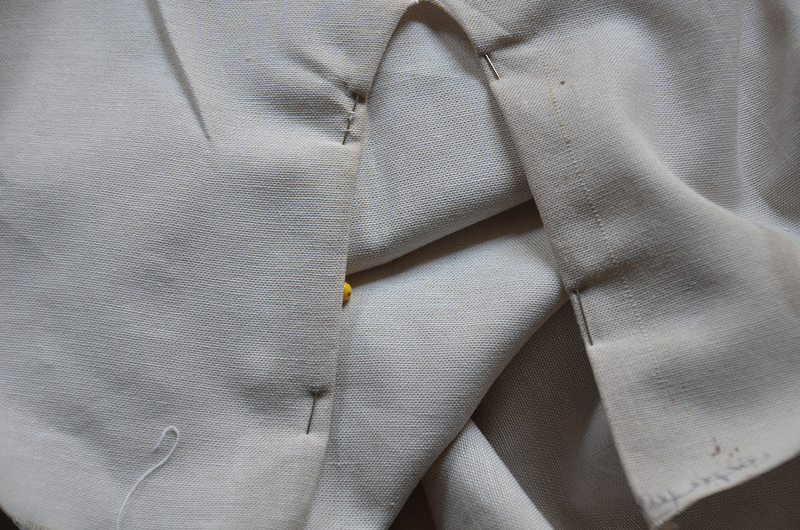 Then sewed it by hand, just because this part of the sleeve is most visible and I wanted it to look good. 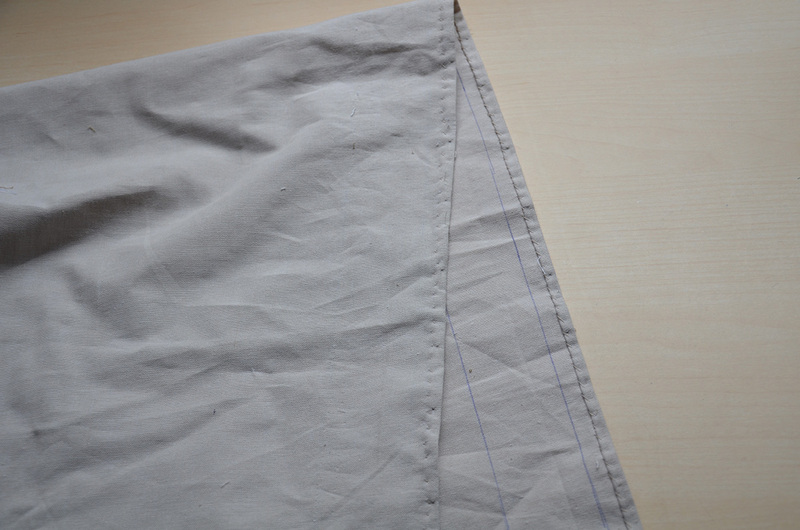 Ignore the other lines of pen – they are part of my original plan for the sleeves which didn’t end up working out. 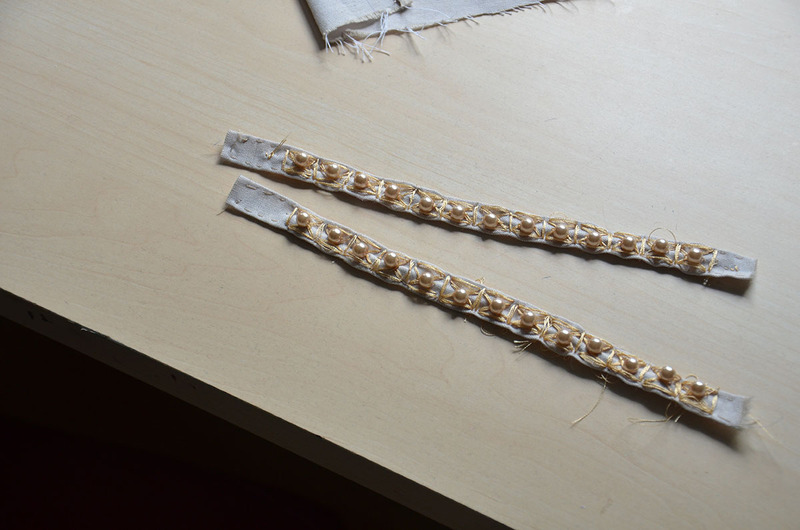 Then I gathered the cuffs down with two rows of super teeny tiny gathers. I don’t know if anyone else would use the word cute to describe gathers, but I think these are pretty cute. 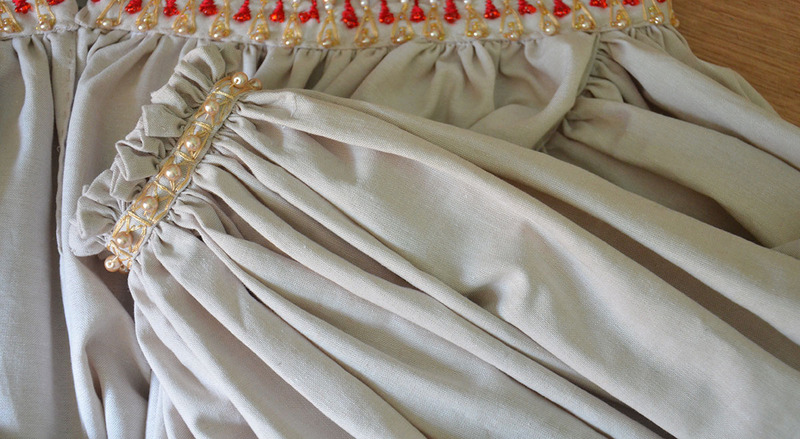 Those got sewn on overtop of my very pretty tiny gathers. 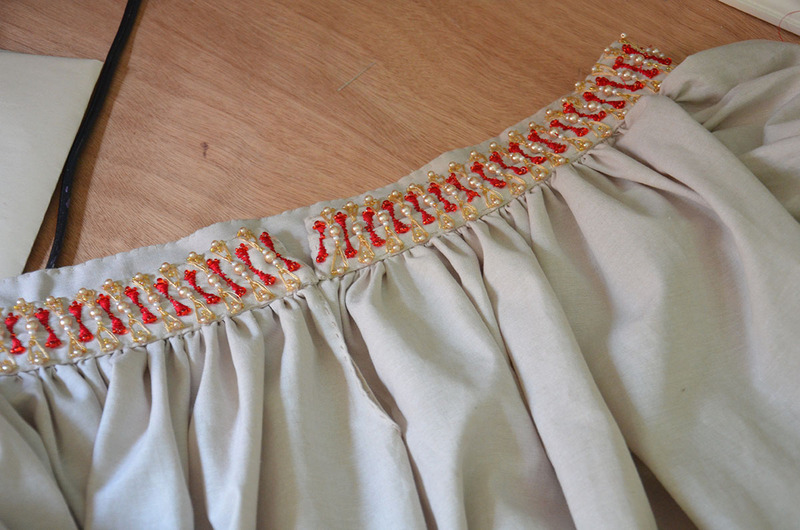 Then I took a step back and began work on the skirt…or dress, the main part of this costume. 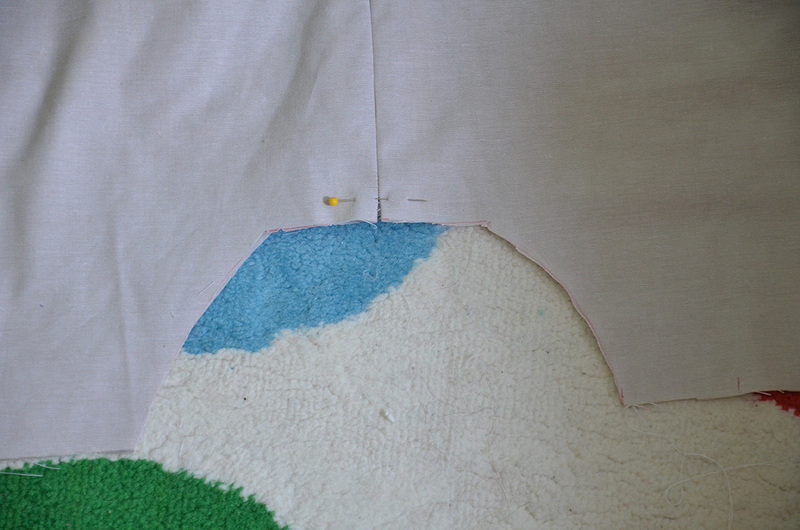 It was three giant rectangles with seams at the sides. The rectangle in the back is longer, and the front one slants inward towards the center…but they are pretty close to being rectangles. I marked out a hem allowance. 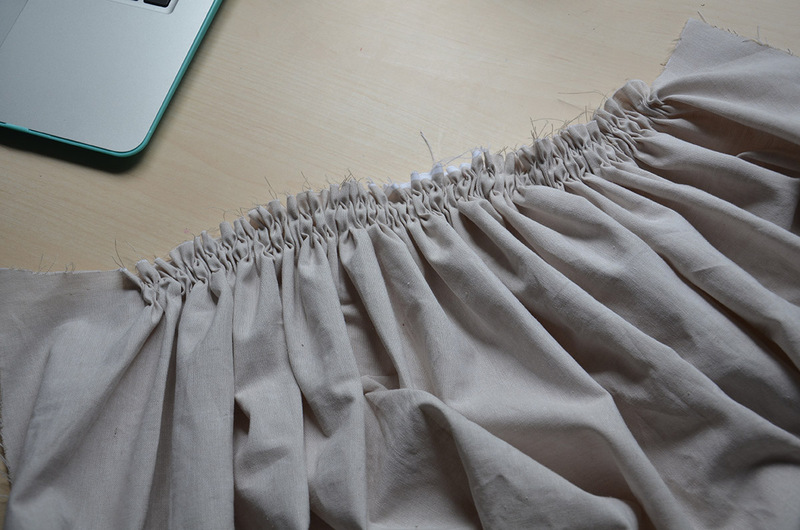 I hemmed it by hand, yay! 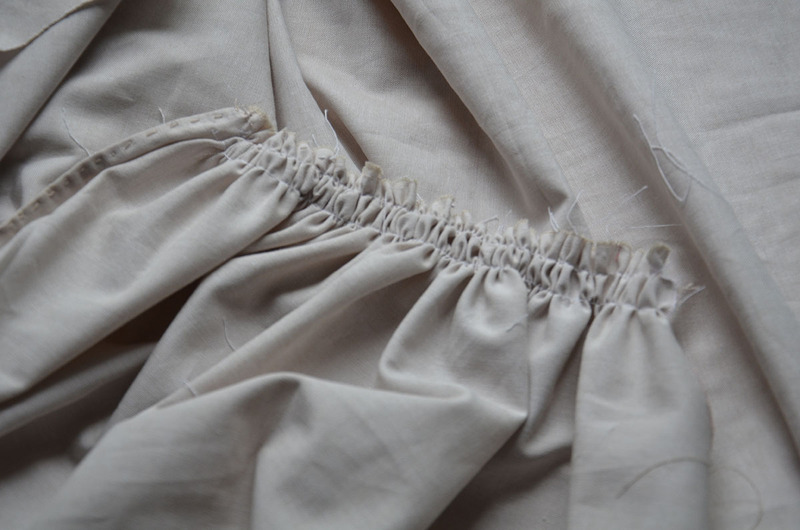 I really do like hemming things. I know people view it as a big chore, but it’s so easy and satisfying, it just takes a bit of time and patience. The next step was cutting out the sleeve holes, I had to make these deeper later on because I forgot there was a one inch seam allowance at the top, oops! 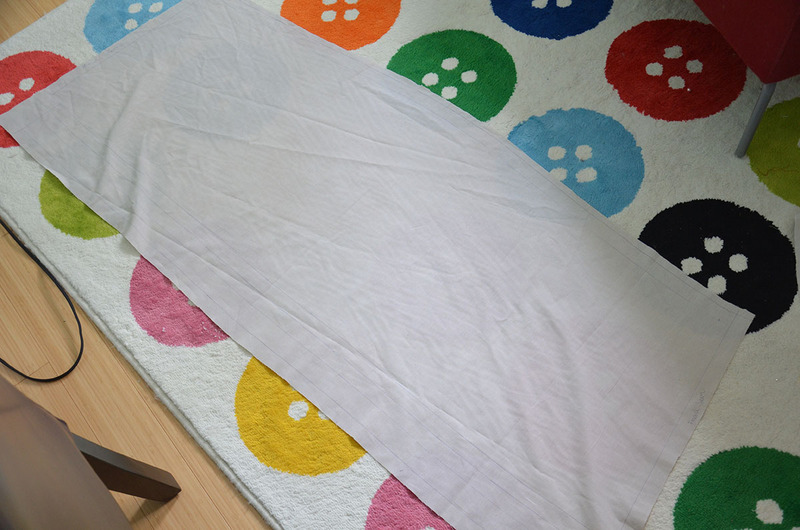 I also cut out the “V” at the front, then rolled the edges over twice to avoid fraying. Once all that was done I gathered the top of the skirt/dress/top/thing, I was struggling a lot with making the gathers even so eventually I stopped and decided to do it by machine. 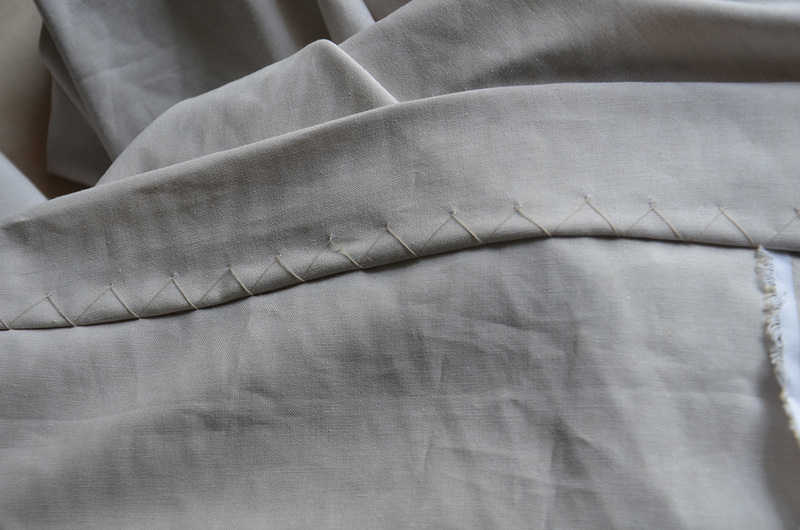 I set the tension really low and used a 5.0 stitch length, then pulled on the threads until the turned to gathers. 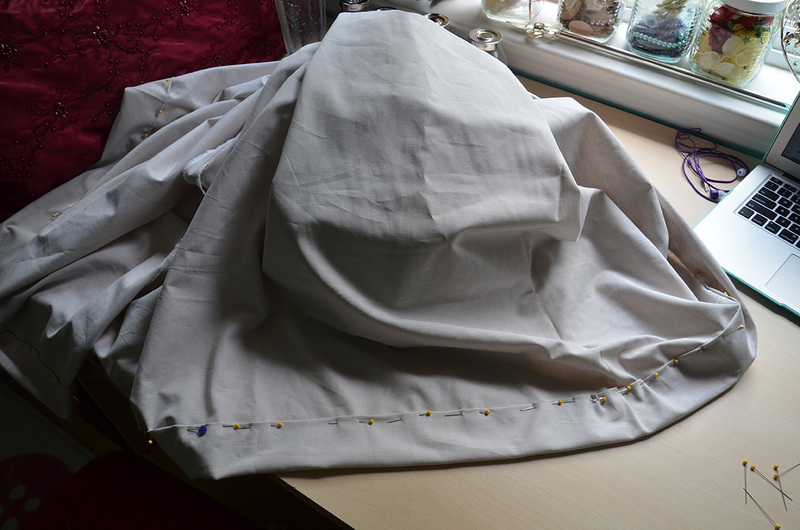 Here is where I lost the photos – The skirt/dress was sewn onto the collar, the collar creates the top part of the sleeve hole, so this had to be done first. 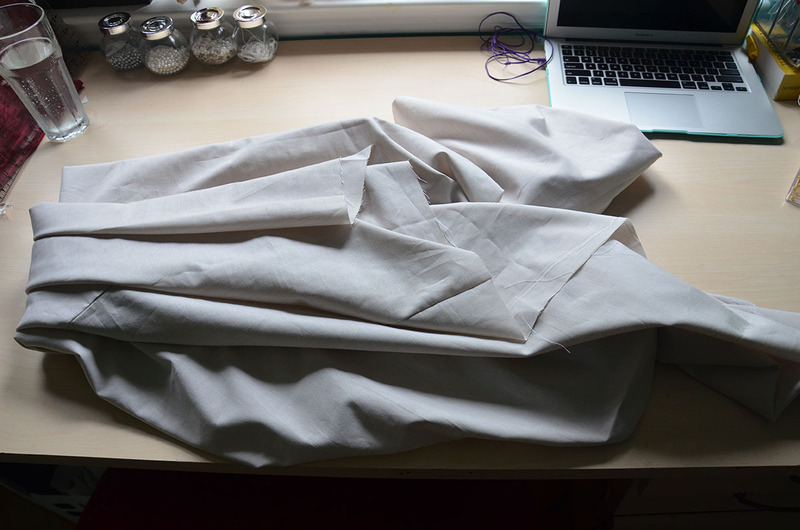 Once that was done I measured the size of the sleeve hole and gathered my sleeves down to that size. 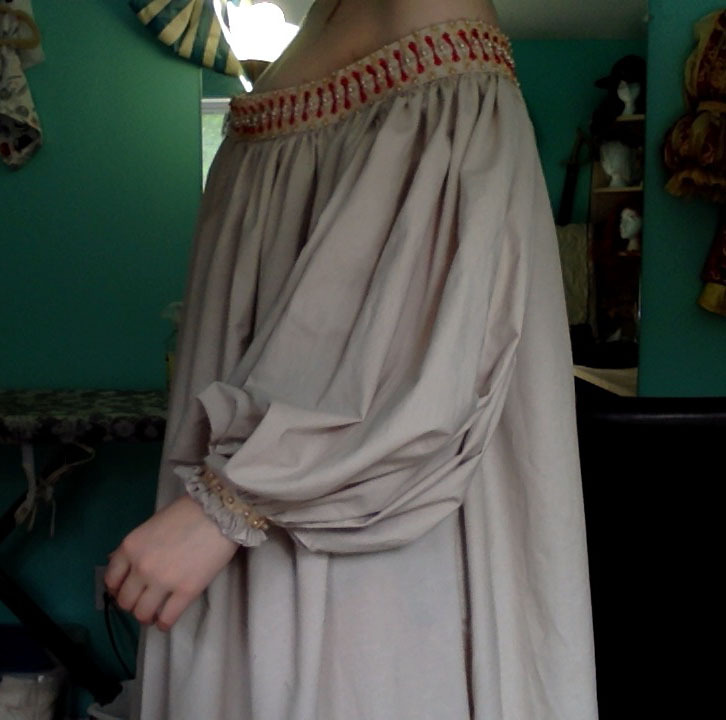 I stitched them into place by hand and bam I had a chemise! Don’t I look thrilled? 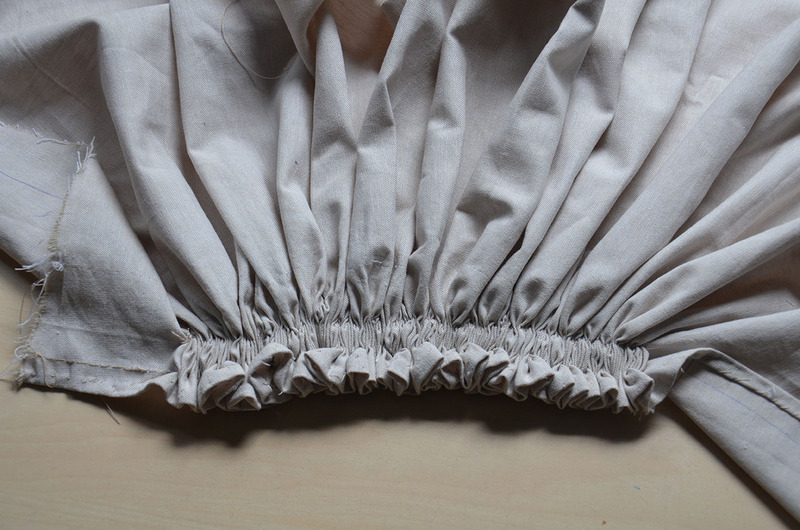 In all honesty chemises kill me because they are so time consuming and such an important part of historical costumery….but they look like a cross between maternity wear and canvas tents. Trying one on and thinking “I spent thirty hours on that” makes me reconsider my love for this hobby. I added hooks to the cuffs so they would fit my wrists tightly. 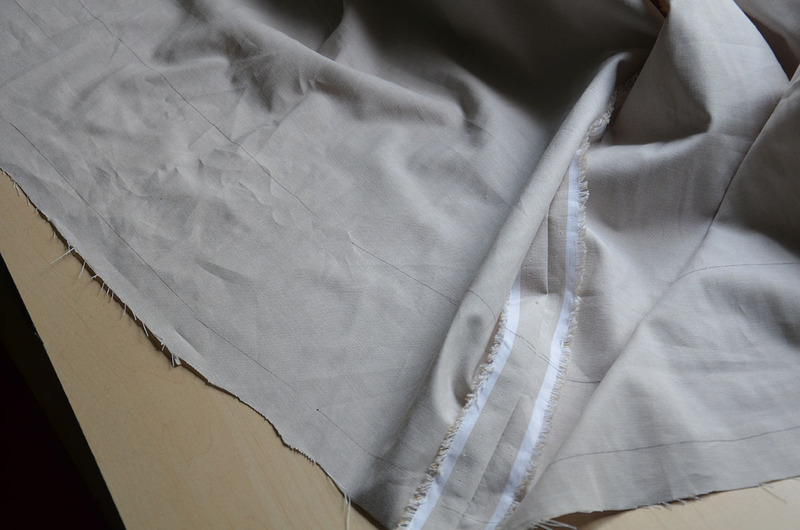 The last thing to do was sewing in lining to the collar, which was pretty easy. So that’s that! I do have photos of the finished ensemble but I’m not going to post them until later in the week. Unless you are a sneak, then you can see them here. Great job!! I love your passion for what you’re doing. Keep it up, good things will come your way. Ola, seu trabalho é uma grande inspiração para mim no ramo da indumentária! Você tem instagran??? Por favor faça um!! Parabéns pelo trabalho primoroso! Amazing outfit plan for this gown. I actually loved this idea, how you are beautifully making it with such simple steps. 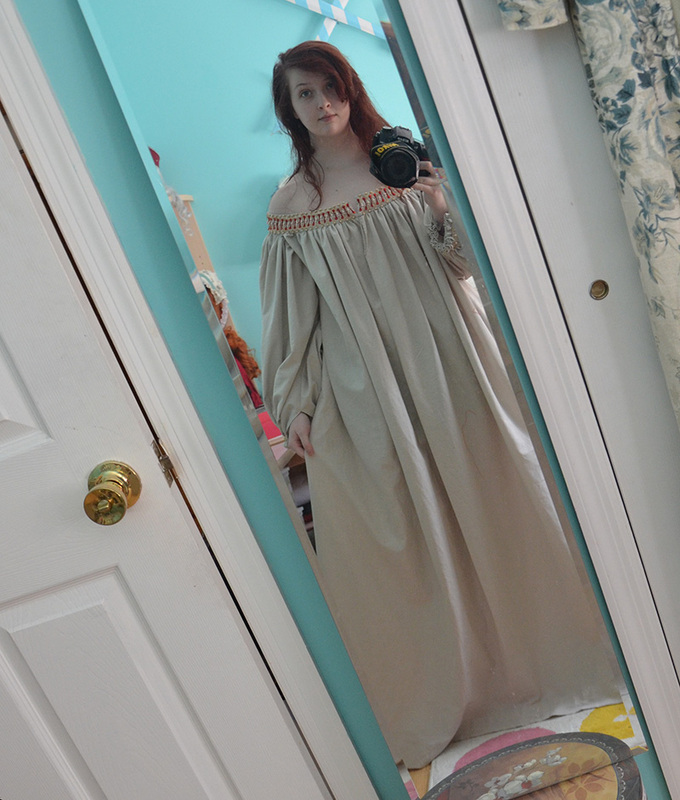 It is good for the Renaissance festival as you get an option for making cheap outfits by your own. Oh that is wonderful 😍 You rule! !